I love my little babes! The big, middle, and littlest baby can drive me a bit insane (that's normal, right? ), but they all really are the bees knees! This weekend was just great! No cleaning was done, Ben and I just got into a couple of tiffs (one cause we were late to a Saturday appointment and another cause we were running late to church), but there was just a whole lot of fun! Too much fun that those things must be shared another time! Hope your weekend was just as fantastic!!! Now, I am off to bed to recuperate from all the excitement. Do you need weekend recuperating too? p.s. Rachel, thank you for True's vintage outfit! We love it!!! 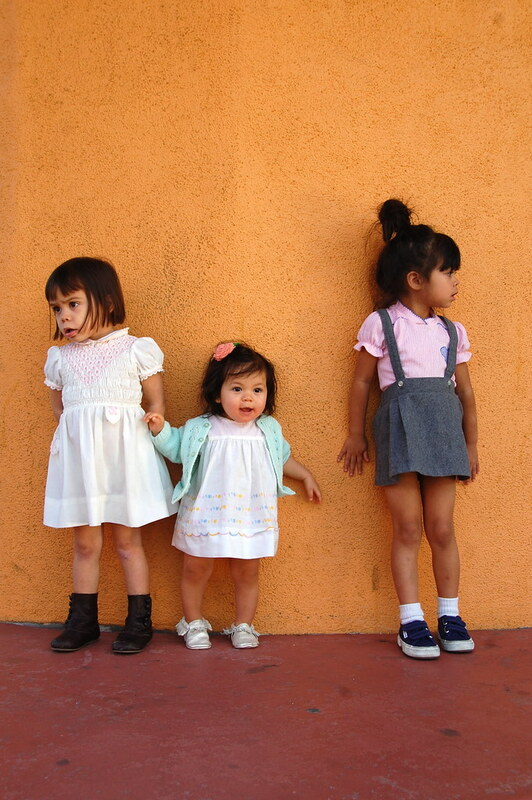 i am dying over the vintage cuteness!!! And your darlins are too cute for words! I LOVE THEM TOO! They are so stylish! True is super tall now!!!!!! I have to tell you that I adore the way you dress your daughters. Living in the midwest where style for kids can seem to be the same old boring thing - I can't wait to apply some of the things I have learned from you to my own children some day! Ok, seriously.... your little girls are the cutest things ever! You inspire me to have stylish kids with awesome names :)I love brave's haircut, it makes her look so sweet! ahhh i can't get over how cute they are!!! i especially love true's little outfit -- the mint sweater and felt flower are just too sweet! seriously cute. Soul isn't a baby anymore! She is getting so big! Gosh, you guys make cute kids!!! I love that bob hair cut on that little one, absolutely darling. Please check out my blog, just starting out, would love your feedback! Your girls are so so cute! The teeny vintage clothes are so pretty. love the grey skirt overalls! all look so cute!